I've decided to throw a curve ball on this link up. Rule breaker right here. I know Valentine's Day is this cheesy holiday for most of you but I thoroughly enjoy having an entire day dedicated to nonsense, lovey mush. People say Valentine's day is dumb or "we celebrate our love everyday" barf. Marriage is not easy, so to have an extra day to make you realize you've got something good, doesn't hurt anyone. Except in this case...my husbands wallet. 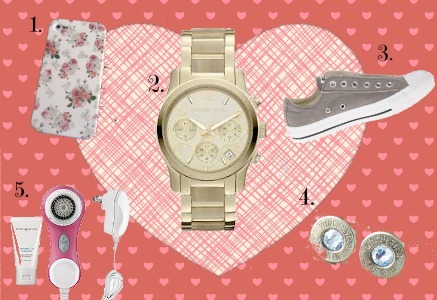 What's on your V-day List? I LOVE my Clarisonic... so worth the money! And the watch... yes, please! Cheesy schmeesy I still love it! Great list! Have a fabulous weekend! Love the Grey Chucks!!! I love my Clarisonic, so worth it! What a cute iPhone case!! Love it! I <3 me some Valentine's Day. I know you're supposed to be all lovey all the time, but life gets crazy and it's nice to have a reminder to slow down and take some time to enjoy each other. Love the MK watch. Recently got a Clarisonic for my birthday and I love it! Works excellent! I actually got my clarisonic for Valentines Day last year! Have really loved it! I've recently cut waaay back on sweets/sugar so I told my husband the only thing I want this year is a cupcake! I hate the "we celebrate our love every day" people. So annoying. I love those gray Chucks! I got a Mary Kay scubber just like the Clarisonic (but much cheaper) and love it. Hello from the link up :) The phone case is super cute!! Hope you're enjoying a lovely weekend! Visiting from the link up. Congrats on your upcoming arrival of a little girl!